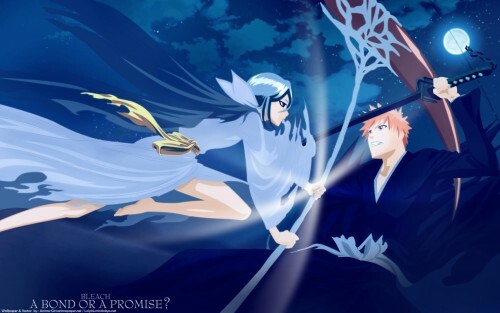 Bleach Wallpaper: A Bond or a Promise? Minitokyo »	Bleach Wallpapers » Bleach Wallpaper: A Bond or a Promise? and i made the floor by painted a vector shape. ichigo's mouth,...they stand out too much with blue color,and blue is killing me. agree with yoru, i think you shoudl just change the color of the outlines on the mouth and such to a darker blue. and everything is too blurry, the foreground shouldnt be. u already know my opinion :) Love love it love it! Great job,blue is my fav.colour. this is not amazing, this is awesome! love it. OMG! This is terrificly COOL! Awesome! Love Bleach! Love your artwork! Oh wow, seriously, what a wallpaper. stunning. Amazing work... And this colors...light, shades... I like it very much! Good fellow!